Note: Items in red are outlinks; others are on this site. Find trailheads providing access to trails in our area, with maps and gps coordinates. 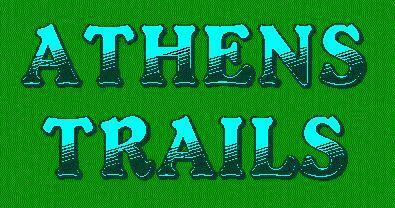 Download copies of trail plans by Athens Trails for our area, available in text, Wordperfect, Microsoft Word, or Acrobat Adobe .pdf files. Link page for all maps on the site; maps are also linked from individual pages. Page includes trail maps, public lands maps, and other maps of interest. Descriptions of great day hikes in the Athens area (go to trail maps link for maps). MAWE (Multigenerational Appalachian Woodland Explorers) is an informal organization that organizes monthly group hikes in our region. The Athens Trail is a project being initiated to build a hiking trail around the City of Athens to improve trails access for area citizens and other hikers. The Hockhocking Adena Bikeway is a 22-mile multi-use (human power only) paved path that extends from Holzer Clinic on East State Street in Athens to Rocky Boots in Nelsonville. The Athens-Belpre Rail-Trail is a new trail being developed in Washington and Athens Counties, Ohio, to connect Athens and Belpre. Most of the trail will be open for hikers, horses and bicycles. (This is an outlink). The Moonville Rail-Trail Project is making a multi-use trail on an old railroad grade in western Athens County (This is an outlink). The North Bend Rail Trail is a 72-mile trail starting just east of Parkersburg, West Virginia and extending east across the state to Wolf Summit, just west of Clarksburg. It is open to hikers, horses and bicycles. There are plans to connect this to the Great Allegheny Passage (see the Power of 32 (These are outlinks). The Buckeye Trail is a major hiking trail that loops around the entire state of Ohio, and passes through northern Athens County, where it is coincident with the North Country National Scenic Trail and the American Discovery Trail (This is an outlink). The North Country National Scenic Trail is a 4,000-mile trail that passes through northern tier states, from upstate New York to North Dakota. It is one of eight National Scenic Trails, and coincides with the Buckeye Trail in southern Ohio (This is an outlink). The American Discovery Trail is a coast-to-coast trail that passes through central tier states, from the Delmarva Peninsula in Delaware to the coast of northern California, and coincides with the Buckeye Trail in southern Ohio (This is an outlink). Trails at Strouds Run State Park, Riddle State Nature Preserve, City of Athens preserve lands, and adjacent areas. Other area trails at state parks, state forests, and national forest. Trails within reasonable driving distance, in Ohio, West Virginia, and Kentucky. We work closely with the . Please visit their website.